Food heavyweight Nestle gave Filipinos two more ways to enjoy coffee following the launch of a first-of its-kind non-dairy creamer in the country. 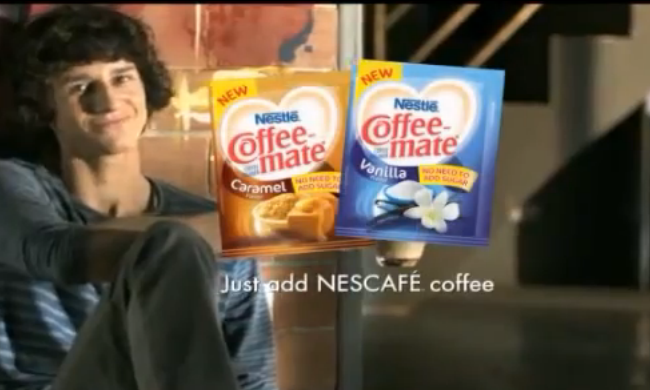 Supported by an integrated marketing campaign, Nestle turned its attention to creamers and developed two new variants under Coffee-Mate – Coffee-Mate Vanilla and Coffee-Mate Caramel. The products are sweetened and flavored coffee creamers, which Carmina Rosales from consumer marketing at Coffee-Mate explains gives consumers control to the strength of their coffee, different to the on-size-fits-all approach of Nescafe numerous 3-in-1 instant coffee brands. In a TV spot launched around February by McCann Worldgroup Philippines, Coffee-Mate Flavors picked French break dancer Arthur Cadre (pictured) to demonstrate what the brand calls “a new twist in preparing coffee” by starting with the creamer first. MRM Worldwide Philippines is supporting Coffee-Mate online through digital campaigns and managing engagement on Facebook, gunning to achieve similar success seen in Nescafe that topped with more than 2 million followers. Speaking with Marketing, Rosales said the new product is targeting young adults belonging to the CD socio-economic classes and is partly meant to boost sales of the unsweetened Nescafe classic. “We are responsible for growing the category and we want to do that through venturing with new format such as the new Nestle Coffee-Mate Flavors. However, we are also expecting that this will also have a ripple effect for the sales of Nescafe Classic, she said without disclosing figures. Following in the footsteps of countries such as Norway and Sweden which have banned unhealthy food advertising to children, local .. The SPH iink Awards invites all creative and media agencies, advertisers and other advertising-related organisations are invited t..